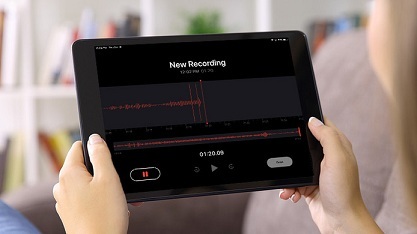 Use voice memos and capture any audio, quickly dictate notes, record riffs anytime anywhere. Just like the name suggests, the built-in Voice Memos helps you record any video you want to save to your iPhone. It may be a lecture at school, interview for the project, voice over for video or a conversation, a speech or note. It all can be done with Voice Memos app on. Apple’s iOS 12 has marked a release of plenty of new features. Although most of the attention has been on the improved Apple Books or the Memoji feature, the Voice Memos app is also attracting some users. You have always created voice memos on your iPhone for so many works; now you can do the same with iPad. This application may seem simple to use. Simply Click on the record button, but there is much more to that. You can save your recording with a name, edit any audio file, share it with the help of email or send it to online service. How to record Voice Memos for iPhone? Go to the Voice Memos App. It will be the big red circle. To open the pause option, click the white button on top of record tab. Click on the pause button for pausing the recording. You can also tap resume if you want to keep the recording in the same file. Click done when you are done. How to listen to existing Voice Memo on iOS devices? You can listen to all recordings you have made in Voice Memos app. On your Home screen, go to the Voice Memos. It can be in the Utility folder. Click the Voice Memo you want to hear. How to replace part of a Voice Memo? Click the Voice memo you want to edit. Click and tap Edit Recording. Toggle waveform right or left till blue play head is placed at the beginning of part that you like to replace. To select a starting place, keep the blue playhead on recording overview at the bottom of the app. Click Replace to record the existing memo again. Click Pause when you are done with recording. Click the memo you would like to trim. Tap the three horizontal dots. On your iOS devices, choose memo and tap edit. Click the yellow handles with arrows on the left to the point you wish the memo to begin. If you want to trim from end, drag yellow arrow on right to where you want the memo. If you are finished with the editing, tap Done. How to Delete part of a Memo? Click on the memo you require to trim. Then Click on Edit Recording. Select the memo on your iOS devices. In the lower recording graph, click the yellow handles with arrows on each of the ends of the memo. Drag left and right yellow arrows to cover that part of the memo which you want to delete. Tap Done if you are finished with the editing.